For over forty years, and with increased energy since 1990, Bernard Mitchell has been collecting people. 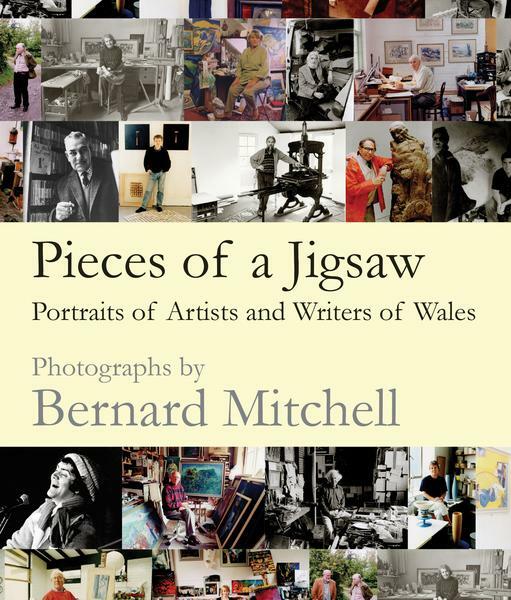 The people are artists and writers working in Wales, and his means of collecting them is the camera lens. 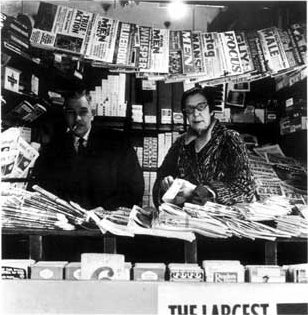 Many people have seen parts of his great project, the Wales Arts Archive, over the years. In the 1990s the National Library of Wales helped to support it through its exhibitions and acquisitions. In 2016 most of his collection found a permanent home in Swansea University’s Richard Burton Archives, and last month Parthian Books published a selection of images from the Archive in a fine book, Pieces of a jigsaw. In his introduction Bernard explains how the project came about – through a desire, during his second year at art college, to record the surviving members of the Kardomah Gang, the pre-War Swansea friends of Dylan Thomas. 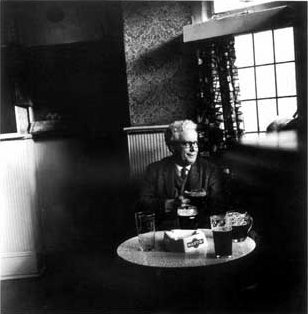 He started with the legendary Ralph Wishart, ‘Ralph the Books’, ‘the Arthur Daley of the book world, fag in hand’, and moved on to the composer Daniel Jones, pint in hand in the Newton Inn, the poet Vernon Watkins, ‘white hair blowing in the sea breeze’ on Pennard Cliffs, and the artists Alfred Janes and Ceri Richards in London. But this was just the prelude. The initial project eventually led to a much more ambitious, open-ended plan to record all kinds of artist and writer working, now or in the past, in Wales. The result is an unparalleled library of images documenting the appearances of around 1,000 (so far) artists and writers. Over 120 of them appear in Pieces of a jigsaw. They give us a chance to admire, and to assess, part of Bernard’s achievement. Perhaps the first thing you notice is that, with one possible exception, the photos are posed. Or, to be accurate, extremely carefully posed. The subjects are never captured unawares, and very seldom in movement. Most directly face the camera: the lens challenges the subject and the subject, defiantly or otherwise, returns the gaze. This is photography that returns to the very birth of the art, when the portrait, a conscious analogue of the traditional painted portrait, required a long exposure and a tranquil sitter. Bernard’s subjects, aware of their dignity, have half an eye on the lens, half on their immortality. Whatever the fate of the art or writing, it’s his picture, as likely as not, that will fix them in the visual memory of posterity. Bernard’s choice of method raises interesting questions about the relationship between photographer and photographee, and particularly about the balance of power between the two. The vocabulary of photography – ‘shooting’ a subject, ‘capturing’ an ‘arresting’ moment – call to mind a figure with gun or baton in hand, calling the ‘shots’ in the encounter. On the other hand, Bernard’s finished image is clearly the product of a long and complex negotiation, in which the sitter has a powerful part to play in deciding on such crucial signifiers as setting, pose and expression. He reveals nothing about how a typical negotiation might pan out, leaving it to us, the viewers, to reconstruct the relationship. He’s also reticent about his aims in recording the images of his targets. Opinions on a photographic portraitist’s mission vary. In 1850 Schopenhauer believed that ‘the outer man is a graphic reproduction of the inner, and the face an expression and revelation of his whole nature’ and that ‘Daguerre’s invention … offers the most complete satisfaction of our curiosity’. Modernism has badly damaged that comforting view, and has even cast doubt on the existence of a ‘whole nature’ lying behind the face. When it was suggested to Franz Kafka that the camera was ‘a mechanical Know-Thyself’, he replied, ‘photography concentrates one’s eyes on the superficial. For that reason it obscures the hidden life which glimmers through the outline of things like a play of light and shade’. I suspect Bernard belongs to the Schopenhauer rather than the Kafka camp, and it’s quite possible that many of his sitters do too. Both seem intent on constructing an image that will reveal something of the interior ‘essence’ of the subject, even if sometimes the revealing is done by appearing to withhold: Alfred Janes stares expressionlessly out of his formal suit and closed hands, and R.S. Thomas glares mercilessly at the poor photographer. If beauty and truth-telling are the magnetic poles of photography, Bernard’s compass veers towards the truth. M. Wynn Thomas, in his foreword to the book, concentrates almost exclusively on the writers. 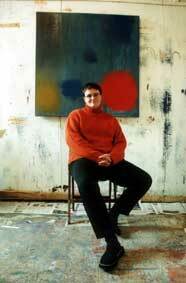 But it’s the portraits of the visual artists that yield most of the striking images. One reason is obvious: that it’s possible to include in the picture the results of visual artist’s creating, and the tools of their trade. These immediately set up a concord, or tension, between the work and the figure of the sitter. Roger Cecil sits meditatively in the centre of a workshop wall, every inch covered with his neat and meticulously curated tools. By contrast, Catrin Webster sits back and organises her body into a confident geometry, her bright red sweater echoed in the red splodge on the canvas hung on a bare wall behind her. Joseph Herman stands in a large studio and a long coat, in front of one of his striking paintings, but his head is bowed and he seems to be trying to shuffle off to his right, to get out of camera range. 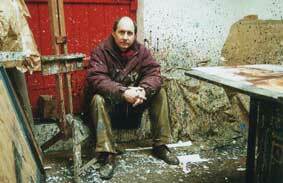 John Elwyn sits on a stool, dwarfed by several large completed canvasses arranged behind him. His space is suspiciously clean and tidied, and he sits, head to one side and with an unblemished cream apron round his neck, as if he were an assistant in a draper’s shop, about to begin a polite conversation with a valued customer. Sometimes the photographs mimic not only painted portraits in general, they enter into direct conversation with the actual paintings of their sitters. The picture of Shani Rhys James, white-coated in her huge barn and surrounded by paintings and paraphernalia, is a kind of reconstruction of her own paintings of her studio. George Little is snapped in front of the river Tawe at White Rock, with the two chimneys of the Hafod copper works behind him: the result is a kind of rehearsal for a typical George Little painting. ‘David Tinker’ is a composition in simple blocks of colour – bright blue sofa, white jumper and brown corduroy trousers – in a reprise of the large rectangular Tinker abstract on the plain wall behind. The picture of David Tress, maybe the most arresting in the book, is a more oblique tribute to an artist’s work. This time no paintings are on view. David sits quietly in his studio, hands clasped, and looks impassively at the lens. But it looks as if a terrible act of paintball carnage has just taken place. The wall, door, table, easel and David’s clothes are all splattered with multicolour spots of paint, and the floor’s littered with white fragments, as if the roof has collapsed. It’s hard for your mind not to move straight from this photo to the wild, raking colours and ripped textures of David’s Pembrokeshire landscapes. The photos of the writers are calmer affairs, on the whole. Some are delightfully informal and radiate the naturally warm and exuberant natures of their sitters, like those of Mererid Hopwood, Dannie Abse, Gwyneth Lewis, Jan Morris and Iris Gower. But many other writers are warier and a few are downright misleading in their taciturnity. Who would guess that Peter Finch, who sits encased in a white mac on a park bench with a tree trunk sprouting from his head, is not an assistant accountant worrying about his early retirement but a wild concrete poet and travelogue writer? Quite a few of the writers, especially the men, look anxious and suspicious. By far the funniest, and most unsettling, is Peter Lord. 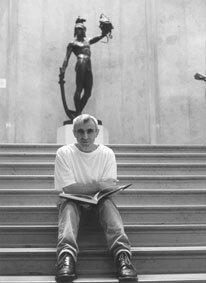 He sits on an empty flight of stone steps in the National Museum with a book, presumably one of his own, on his knees. Behind him, at the top of the stairs, stands Perseus, holding a long curved sword in one hand and the head of Medusa in the other. The photo may have been taken a few years ago. What might have seemed comic or satiric then seems more sinister today, when Perseus holds a new, chilling association – that of a videoed ISIS fanatic on the point of beheading a captured enemy. On the opposite page Bernard, or his editor, has placed a second photo that uses a similar composition to subvert the first image. This time the poet Sally Roberts Jones, smiling benevolently, seems to lack Peter Lord’s assertiveness. Above her head, peeping over a hedge, stands another sculpture: not the metallic and bloodthirsty Perseus but one of those meek concrete maidens in the garden at Gregynog, having trouble controlling her dress in the wind. The book offers lots of opportunities to make these interesting comparisons and contrasts. It repays plenty of close looking. Bernard has the acutest of eyes, and enjoys packing his pictures with clues and hints. Inevitably, with a project developed over many years, you’re often reminded that, in Susan Sontag’s words, ‘photography is an elegiac art, a twilight art’. On my reckoning almost fifty of Bernard’s subjects are now dead. His pictures of them have already taken their place in the public memory of their achievements, alongside their art. As Sontag says, ‘all photographs are memento mori. To take a photograph is to participate in another person’s mortality, vulnerability, mutability’. Almost everybody is having his ‘mug’ engraved nowadays; so that this test of distinction is going to be reversed; and therefore, to see one’s ‘mug’ in a magazine is presumptive evidence that he’s a nobody … I respectfully decline being oblivionated.